Recently I have come across several designs that take inspiration from urban living and city landscapes, offerings some refreshingly original design motifs and patterns. One example is Timorous Beasties fantastic Toile collection. Unlike traditional French toile designs of charming pastoral scenes, Beasties’ toiles offer a contemporary twist on the French classic. Their wallpaper and fabric motifs display a surprising and honest depiction of city life. Iconic cityscapes, park life, crime scenes, promenading and rude boys are just a few of the engaging narratives that take place in these designs. There are differing toiles for London, New York, Glasgow and Edinburgh, and each with its own feel and cityscape. Another example of urban themed decor is Marimekko’s new Siirtolapuutarha range. Made up of a selection of crockery and textiles, the pieces have a lovely illustrative design motif that eludes to cityscapes and urban living. Sure enough, the design for this range is inspired by city life, in particular small city gardens. The word siirtolapuutarha is a Finnish term that refers to small community plots of land in the city that are used for gardens and allotments. Each piece tells a different part of the siirtolapuurtarha story, from ‘a morsel of nature in the urban jungle’ to the ‘tiny gardens tucked into the nooks of urban life’ – Marimekko. So you need look no further than out onto the street to find something new to be inspired by. This article first appeared on the Cambridge Evening News website. I always get excited about this time of year when sitting outdoors becomes an enjoyable way to spend an afternoon, and wild flowers start to appear in the garden. As garden flowers make for such a nice display, it would seem a shame not to make the most of them. Decorating with flowers can be an effective and inexpensive way to offer an additional burst of life, colour and scent into a room. I have put together a few examples of imaginative ways to display your garden plants and flowers, even if only a single stem! The Bowl Shelf, a new component of the innovative String shelving series, is made of plastic with three compartments and is perfect for displaying and growing plants indoors! The Bowl Shelf, along with other ‘String’ components can be found at www.skandium.com, at £90 per unit. This charming Hanging Blume Tube by Rowen & Wren is a great way to make an attractive flower display with a single stem. Available at www.notonthehighstreet.com, at £14 for a set of two. Here is another simple way to display a single flower. Two Vintage Style Mini Bottles by The Flower Studio, from www.notonthehighstreet, £8.99. The Woolly Pocket company do a great range of breathable table and wall planters, which are suitable for indoors and available in a variety of colours. www.woollypocket.co.uk, £15.99 for a table planter. Woolly Pocket’s breathable wall planters are particularly fun, and allow you to create indoor living plant walls. I recommend you take a look at their online inspiration gallery, where they showcase many inventive ways to have indoor wall gardens. www.woollypocket.co.uk, £29.99 for one unit. This quirky, unconventional Light bulb Vase by London Garden Trading makes for a striking flower display, from www.notonthehighstreet.com, £12.95. These Two Metallic Plant Pots from Rocket St George would be a stylish way to display your garden plants. Available at www.rockettstgeorge.co.uk, £45 for a set of two. So make the most of this spring, and bring the outside in. Geometrically inspired designs are a current theme in interiors, including a pleasing inclination towards tessellation. For those who don’t know, tessellation is a distinct type of pattern where one shape is repeated without any gap or overlap when placed side by side. These sorts of patterns often appear in interiors, and their appealing geometric qualities often result in an interesting and cohesive design. Here are a few examples for you to enjoy. The work of fabric designer, Eleanor Pritchard is characterised by bold geometric and graphic reversible patterns making use of inky tones and sharp accents. Her focus on geometry means that several of her designs have beautiful tessellating patterns. The hexagonal ‘Pov candleholder’ by Menu is cool and quirky, and as a tessellating shape it can be built up to form a larger pattern on your wall. Using the same shape, Merve Kahraman has designed this extraordinary ‘ Diplopia Monochrome’ table, and goes a step further by emphasising the 3D cube optical illusion. This stereographic effect is produced through combining different shades of marble. Contact Merve Kahraman for prices. Iconic chair company, Vitra, have recently brought out the ‘Maharam pillows’ range, designed by Hella Jongerius. 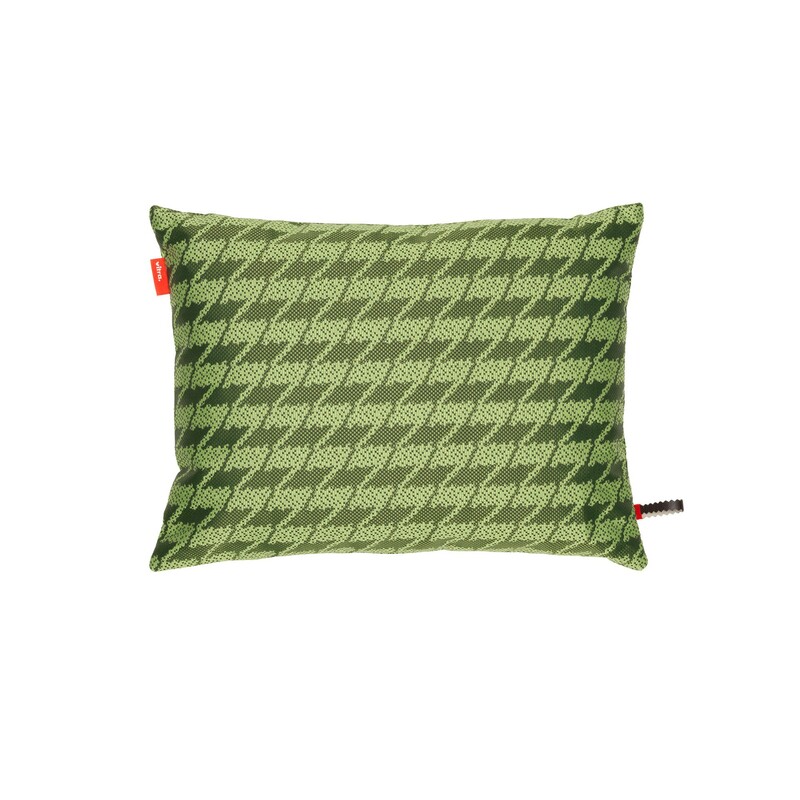 This includes a selection using the classic tessellating Hound’s tooth check, but with a colourful twist! Tiles tessellate by nature and ceramic company, Made a Mano play to this by incorporating the tessellating theme into some of there designs. One example is the Komon Natura Viceversa, which Inspired by Japanese small decorations, is made up of an isosceles triangle repeatedly rotated. The folded forms of origami and sculpted paper often come from repeat patterns of one shape to form a structure, which can be very simple or rather complex as is shown by the two examples of folded light pendants below. Autumn is my preferred time of year because of its dynamic celestial weather and my enhanced appreciation for cosy interiors. The recent blustery winds and bright rains have reminded me of some of my favourite designers that have used this to inspire their designs for the home. First example is Marimekko and their fantastic current WeatherDiaryRange, which consists of a variety of collections. This range of fabrics, home textiles and dishes are designed using Aino-Maija Metsola’s gorgeous observational paintings and sketches of changing weather and autumnal colours, and they definitely communicate the dynamic seasonal mood. Here are a few examples. Kuuskajaskari Fabric, by www.marimekko.com, from Skandium. The colour scheme has been taken from the autumnal season and depicts autumn winds. Oiva Saapaivakirja Tea Pot and Mug, by Marimekko, from Skandium. The design captures highlights of autumnal weather patterns and colours, and evokes an image of reeds swaying in the wind. Oiva Saapaivakirja Plate, by Marimekko, from Skandium. This is one of several attractive plates in the Saapaivakirja collection, and was inspired by rainfalls and sunrays. Jussaro Fabric, by Marimekko. This last example of Marimekko’s WeatherDiaryRange, gives a wonderful impression of rolling storm clouds and thunder. Cloud – Autumn Rug, by Luke Irwin. This stunning rug is one of a set of four cloud rugs, with one for each season. The cloud shapes for autumn are a dash more manic than the others! De Gournay’s luxurious wall papers are always striking and dynamic and often inspired by weather. Windswept Blossom, by De Gournay. This enchanting blossom tree captures the transition from summer to autumn perfectly. Cranes, by De Gournay. I love this chaotic yet elegant display of wind blown cranes. Flying Ducks Velvet Sky, by Mulberry Home, from Lee Jofa. Mulberry’s Duck velvet is another lovely fabric that shows an array of windblown birds, playfully ducking and diving in the sky. On the subject of flight, Coral and Tusk have got a charming range of embroidered home accessories, many of which feature feather patterns. Large Feather Table Runner, by Coral and Tusk. Detailed with peregrine falcon, owl and peacock tail feathers, these embroideries have a lovely illustrated style, with gorgeous splashes of autumnal colours. 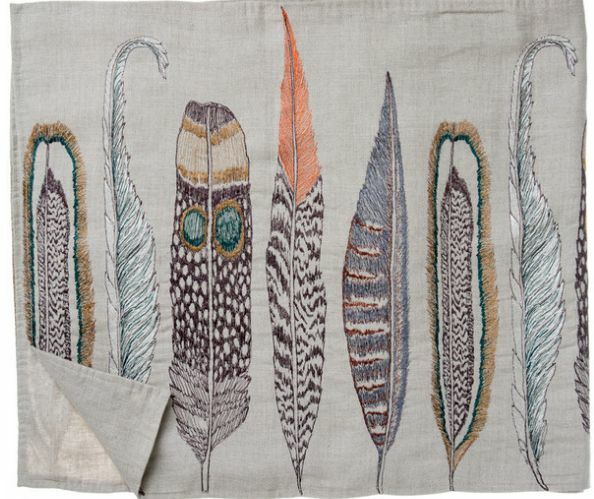 Feather Vertical Curtain Panel, by Coral and Tusk. Cole and Son have fantastic wall coverings depicting scenes and landscapes, including a couple of great celestial designs. Nuvole, by Cole and Son. I always imagine this beautiful mural to be an autumnal scene, combining wonderfully energetic clouds, with glimpses of sunshine. Macchine Volanti, by Cole and Son. This wall paper is another wonderful sky scene with a combination of quirky flying machines demonstrating all sorts of air navigation. We hope you all survived St Jude storm’s visit safely and are still able to enjoy the blustery autumn weather! I am always looking for creative ways to add expression and character to my home, and more often than not I rely on artistic work to do this. On my current search for art in unusual places, I have come across a number of inspiring products that have their own painterly quality. Going beyond the canvas, I have selected a variety of furnishings that can offer unusual artistic expression to your home. Artist Marlene Mocquet has put together these fabulous plate designs to mark the 150th anniversary of Bernardaud, French porcelain manufacturer. As one of 11 artists involved, her work is my absolute favourite. At first glance they look like an artist’s palette, but upon second glance the quirky characters start to reveal themselves. Skandium have a beautiful range of Oiva Saapaivakirja plates by Marimekko, with a fluid paint design. With their watery, striking colour, these Tincture glasses from Anthropologie would be a great match for the Oiva Saapaivakirja plates. You can find this charming Colour Test glassware from Anthropologie. The carafe and glasses serve as both a pretty, but also quirky table piece. French designer, Elodie Gobin uses an ecological dyeing process to create her attractive Botanic Colour cutlery. Tiles can be a really interesting way to add personality to a space. Designer, Hilda Hellstrom, has started to produce some unique and visually stunning items using resin Jesmonite, such as these Sedimentation tiles. So keep a look out for this emerging talent. This Upcycled Painted Highchair from The Old Cinema is a characterful example of how, with the help of sand paper and a few pots of paint, you can really personalise an old piece of furniture. Here is another, slightly more extravagant, example of a personalised piece of painted furniture. You can get this 19th Century Window Mirror with hand painted glass panels from The Old Cinema. I was recently overjoyed to find out that my favourite Parisian shop, Merci, has now got an online store! They stock a range of great design, from clothes to furniture. Merci recently held an exhibition of plastician artist, Aurélie Mathigot’s work called Timeless Linen. She created a limited edition of 111 exquisite coloured and embroidered linen bags. The collection is a fantastic composition of colour. Merci do a brilliant range of coloured linen for sheets, bed covers and cushions, which gives you the chance to get creative with composition and colour combinations. With the help of a little artistic license and a brave choice of colour, there are countless ways to get a touch of artistic expression into your home design, so stay on the lookout for ways to keep your home creative.